Years ago, before anyone outside the military-industrial-academic complex had ever heard of the Internet, I read an item about dictionaries in, I think, the New Yorker. The author had been scandalized to find a brand-new, current dictionary in a trash bin, and was wondering why someone would throw it out. Maybe they already had a dictionary, she thought, but “one dictionary per room sounds about right to me.” I agreed. In high school in the 70s, a teacher angrily scolded my class when nobody could define a particular word in the literary passage we all had read as homework. “If you don’t look up the words you don’t know, you don’t deserve the beauty of literature,” she said. I’m not sure about her exact quote, but four decades later I still feel the lash in her voice. I developed a habit of reading with a paperback dictionary in one hand, thumbing through it as needed. Now it’s 2015, well into the Kindle era, and I can’t remember the last time I purchased a physical book — or opened a printed dictionary. Depending on the device, looking up a word is as simple as right-clicking or touching a screen. 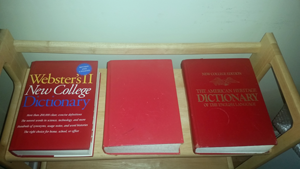 In a continuing effort to declutter our lives and our bookcases this weekend, I came across three collegiate-sized red dictionaries. (Why were they always red?) The newest was published in 2001, the oldest in 1976. That one has a circular water stain on the cover, the residue of a thoughtless roommate who used it as a coaster. That water stain has accompanied me through at least 10 moves over nearly 40 years. Which is more scandalous or silly: the fact that I’m throwing two dictionaries away, or that I’m saving one?